Vilnius (heinnews) – The 47-year-old is anything but flashy, wearing a simple white t-shirt and light blue jeans. But his hands are like those of a monster, giving a very firm handshake. And his light brown hair is only slightly graying around his ears. Sitting at a booth in his own sports bar, one easily gets a sense of the pride he has talking about some of the fantastic things he has accomplished over his lifetime. Yes, Raimondas Šarūnas Marčiulionis – known as Šarūnas, or even just Saras – is enjoying his life. The Lithuanian basketball legend is hanging out at Stars and Legends, the sports bar he owns which is adjoined to his own hotel – Šarūnas Hotel – and just a few steps away from his own youth basketball academy. This complex on the east side of the Lithuanian capital of Vilnius represents many of the different sides of Marčiulionis and his meaning to the country, the sport of basketball and the youth of the game. “Sure, it’s a good feeling that people can sit here and enjoy basketball,” Marčiulionis says in his usual upbeat manner. Marčiulionis says this as the Spain – Serbia game at the 2011 European Championship is just tipping off. And later in the evening the national basketball hero will be welcome hundreds of patrons to watch the home Lithuania national team play France. Over the course of the discussion, it almost sounds like Marčiulionis feels sorry for the current group of Lithuanian national team players, who face the pressure and expectation of winning the country’s first continental title since 2003 and the media and marketing burden of a basketball-mad nation hosting their first European Championship since 1939. And everybody wanting a piece of them. “You see all this craziness. You haven’t watched TV here in the past couple of months. It’s really difficult to understand what’s going on,” said Marčiulionis, who visited the Lithuanian national team in the locker room after they won gold in Sweden eight years ago. Marčiulionis never felt the public adoration so directly as Jonas Valančiūnas and the 2011 team does. He even said it seemed like they were like movie stars. “I didn’t feel that way back then how the players feel now because they have to be models, PR spokesmen, movie stars, they do everything. There are 23 sponsors and they participate in each of their promotions. Where is the basketball?” asked Marčiulionis. The current national team players of course know who Marčiulionis is and what he means to the sport in the country. But rising star Valančiūnas was 94 days old when Marčiulionis helped Lithuania to the bronze medal at the 1992 Olympics, when the Dream Team with Michael Jordan and Larry Bird and Magic Johnson dominatingly took gold. Still Marčiulionis has a very tight connection to the national team. After all, he helped two of them become internationally-renown players. 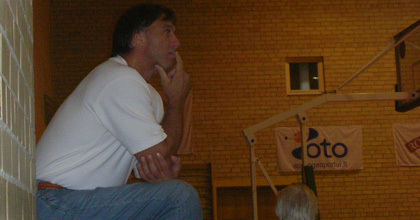 Both Simas Jasaitis and Kšyštof Lavrinovič attended Marčiulionis’s basketball academy. Kšyštof also attended with his twin brother Darjuš, who would be on the Lithuania team if not for an injury. Linas Kleiza also spent a couple years there. Lavrinovič also praised the academy. “It’s a great school. It was a big step for me to build my future. I am proud of this school. 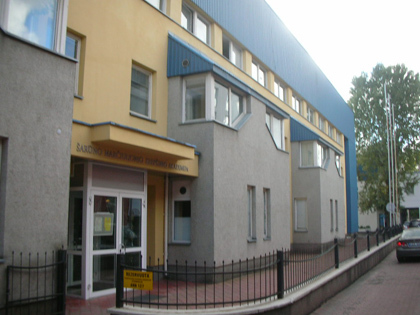 I think it’s one of the best schools in Lithuania,” said Kšyštof Lavrinovič. It was clear from the sports bar just how meaningful Marčiulionis’s academy was to the twin brothers. 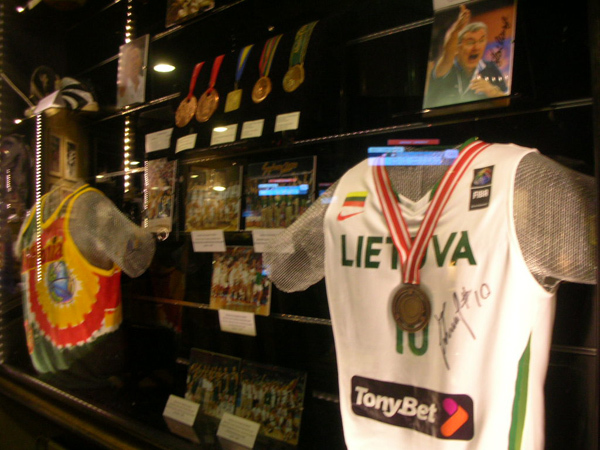 Kšyštof gave both his 2003 European gold and 2007 European bronze medals to be displayed among the memorabilia in Stars and Legends while Darjuš’s 2007 medal is hanging in one of the cases. In that same case are Marčiulionis’s two Olympic bronze medals – from 1992 and 1996. The medal from Barcelona in 1992 is one of the most well-loved stories in sports history. Lithuania was granted its independence from the Soviet Union in 1990. And Marčiulionis immediately started resurrecting the Lithuanian national team, lining up players. But the major hurdle for the Baltic nation was money. Marčiulionis, who had already been in the United States with the Golden State Warriors since 1989, eventually was introduced to Jerry Garcia of the Grateful Dead. 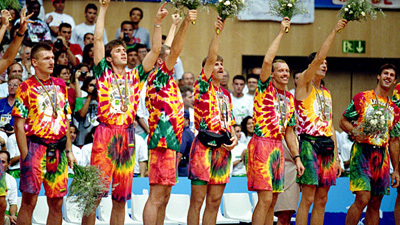 The Dead donated 5,000 dollars and allowed one of its licensees – artist Greg Speirs – to provide the Lithuanian players with red, yellow and green tie-dyed T-shirts. Speirs would actually end up donating 400,000 dollars in profits from his trademarked “Slam Dunking Skeleton” basketball jersey to the team – making the trip to the Olympics possible for Marčiulionis and his teammates. The T-shirts were a huge hit even though Lithuania did not wear them during games. 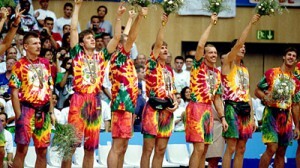 The players did show up at the medal ceremony in head-to-toe tie-dye in accepting their bronze medals. Besides launching Lithuania into the hearts of basketball fans around the world, the bronze medal also marked a huge victory on a different level for the country of some 3.2 million people. Lithuania beat the former Soviet Union team CIS 82-78 – the side from the former occupying power for nearly 50 years. Marčiulionis didn’t see it on that level. “I didn’t put it that way because we grew up in the former Soviet Union. The ideology was different. 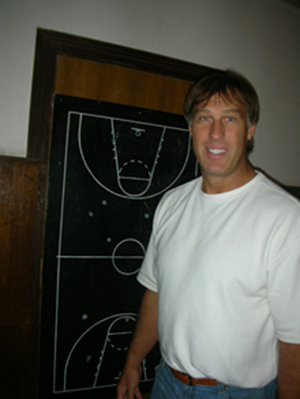 I would say I played against my former teammates,” said Marčiulionis. “Of course we felt the pressure from back home. For people who were hurt by repressions or families that were hurt by the system in general, that was a big deal. It was a big celebration. Payback is something Marčiulionis knows plenty about. Paying back was an issue even when he was working on getting the Soviet Union to allow him to leave for the United States and the NBA. “Most disagreements in this world are about money. That was it. They wanted to have a bigger piece,” Marčiulionis recalls with a smile on his face. The government was telling the star that he could not make more than a counsel in the Soviet Union or an ambassador outside the country – meaning about 600 dollars a month. Marčiulionis’s Lithuanian club Statyba Vilnius wanted a piece as did the state basketball federation and others. “That was too many hands. I said no, I want to give but I won’t allow you to take from me what’s mine,” said Marčiulionis. His experience in the United States and the NBA as well as his handling of the organizing of Lithuania’s trip to the Olympics helped Marčiulionis in even more efforts to give back to his home nation. In 1993, he founded the Lithuanian Basketball League, LKL, implementing some American and NBA elements into the local environment as well as signing television and sponsorship deals for the league. “Players stayed in Lithuania. They didn’t just disappear,” said Marčiulionis of the league of which he served as president for 10 years. Another thing helping the league is a big-time rivalry between the nation’s two biggest clubs – Zalgiris Kaunas and Lietuvos Rytas, who have won all 18 of the LKL titles since 1994 with Zalgiris taking the first six and 13 overall. “That’s a real rivalry and keeps intrigue. So a few factors help click in to make things happen in Lithuania,” said Marčiulionis. The other way Marčiulionis sought to pay back his home nation was to found his own basketball academy – the Šarūno Marčiulionio Krepšinio Akademjia – in 1992. “That was my contribution or payback to Lithuania,” recalls Marčiulionis. The blue, yellow and gray post-Communist building houses three courts. The private basketball school has 700 kids between the ages of 6 and 19 with a waiting list for more. The training costs between 60 and 200 litas (18 to 58 euro) per month for those who can pay. The academy looks for sponsors for children of parents who cannot afford the fees. Looking at the wall of the first court, it’s clear that Marčiulionis’s academy has had its share of success over the years with 43 banners hanging, representing Lithuanian or European champions at the children, cadets, junior and youth levels. The best year was in 2009 when the academy came up with seven titles. And for 2011 there are five banners hanging. The morning session has a group of 12-year-olds working on one-handed shots and low post moves among other drills before finishing the day with sit-ups and push-ups. Among the jerseys being worn are a LeBron James number 6 for Miami as well as Mike Batiste’s number 8 for Panathinaikos while one youngster is wearing a Tim Duncan San Antonio jersey and another has donned a Lietuvos Rytas Simas Jasaitis jersey. Jasaitis is not only represented by the youngster’s jersey but his likeness hangs from the side wall of the center court on an advertisement for Viva Sports drink from Vichy. The message should be clear for the youngsters – if you work hard enough the Marčiulionis academy can turn you into a European star and national team hero, just like former academy cadet Jasaitis. The academy focuses on three main areas of preparation for the players – physical, tactical and psychological. In physical training, the professionally trained coaches work on coordination, stamina, feet and hand quickness, first step explosiveness and individual work with basketball and weights. In tactical, they deal with individual and team work skills development; in game roles and discipline; and understanding and adopting game strategy. While in the psychological part, the players work on focus, concentration, self confidence and confidence in your teammates as well as relaxation, respect and unselfishness. “Everything happens starting with children. If you can teach them the right fundamentals, later on you can get good results,” said Marčiulionis. The legend also feels that he is starting to get more involved with the kids again. “I am a lot closer than the past. I am starting to have fun and want to implement more things, more my style,” said Marčiulionis, who says he doesn’t like how basketball is played at the moment. Perhaps a big reason Marčiulionisis more involved is a 9-year-old child wearing a blue shirt at the far end of the middle court later in the afternoon. 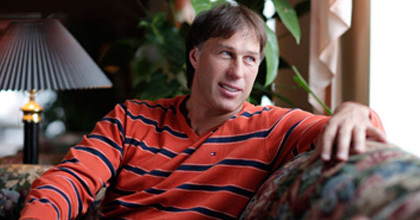 Augustas Marčiulionis has the name of a basketball player, and his proud father of three children believes the second child – and only son – has a bit of game as well. “He sees the game well. He dribbles well left but shoots right,” Marčiulionis gave as a scouting report of his son. Augustus Marčiulionis may eventually be part of a long on-going battle between his father and fellow Lithuanian basketball legend Arvydas Sabonis, who started his own basketball academy in 1994 and has also been producing Lithuanian stars and national team players – Mantas Kalnietis and Paulius Jankunas from the current squad. The Lithuanian youth titles are most commonly decided between Sabonis teams and Marčiulionis teams. “It’s usually us against Sabonis. But the small teams want to nibble on us as well. They really want to beat us. But that pushes us as well. We want to stay at a higher level,” said current academy head coach Šarūnas Sakalauskas. Last season, Sabonis’s team won. Something which didn’t sit well with Marčiulionis. “I I lost last year. Now we have to win,” said a frustrated Marčiulionis. Marčiulionis wants to win – that’s it. Whether it’s flashy or not.